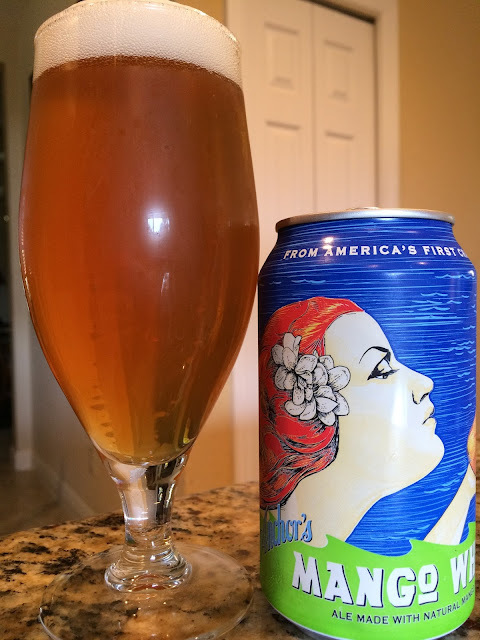 A few months ago, I had the chance to check out Anchor Mango Wheat with Anchor Brewmaster Scott Ungermann. Today I'm drinking it alone! The packaging of this beer along with its sister Meyer Lemon Lager are unlike any other Anchor beers I've ever seen. First it's canned; second a woman with flowing hair and lots of colors adorn each of the new products. Very fun. 4.5% alcohol. Subtle sweet mango aroma. More pronounced mango flavors come first, sweet, then lightly tangy. There is enough bitter balance to tone down the initial sweet fruity flavors. Nicely carbonated and very tasty. Check it out!